Governor Terry Branstad says he’s confident the interim director he’s asked to lead the Department of Administrative Services will ensure no records are destroyed. Branstad fired Mike Carroll, the agency’s now-former director, late Tuesday afternoon — shortly after legislators were given email that showed the agency’s legal counsel offered a laid off worker $6500 if she would keep her exit agreement secret. Phipps is a retired Iowa National Guard general who has worked in state government before. The email exchange released yesterday shows Ryan Lamb, legal counsel for the Department of Administrative Services, had negotiated with the lawyer for a laid off employee and agreed to pay what critics have called “hush money” to make the settlement confidential. Lamb left that job six weeks ago, shortly before the deals were revealed in a Des Moines Register investigation. Branstad said his chief of staff talked with Lamb three weeks ago and asked Lamb if any of the 24 laid off state workers who got exit settlements had been paid extra to keep the deals secret. 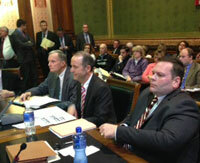 Branstad does not plan to fire any other employees in the agency. Democrats in the state senate have called on Branstad to put at least two other top administrators in the agency on paid leave. Those administrators appeared before the Legislative Oversight Committee last week, along with Carroll, when Carroll told legislators there were no “hush money” settlements.